That was then. Now, with a former ACC senior official essentially running the TSCA office at EPA, the agency is virtually following ACC’s script. 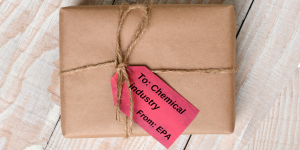 On November 15, EPA announced the release of the first of its draft risk evaluations for the first 10 chemicals being reviewed under TSCA. The draft risk evaluation is for a chemical called Pigment Violet 29 (PV29). One notable aspect of this chemical is how few hazard studies have been conducted. EDF prominently flagged this concern in the last round of public comment in August, noting that the chemical lacked data on chronic effects. It doesn’t have the minimum amount of information deemed by international authorities as necessary to conduct even a screening-level assessment of a chemical’s hazards, let alone a full risk evaluation. Despite receiving these and similar comments from stakeholders, EPA took no steps to fill these major data gaps and as a result its new draft includes no additional data (which didn’t stop the agency from declaring the chemical safe). Instead, EPA only provides links to summaries of most of the studies that were prepared by the companies that registered the chemical under the EU’s REACH Regulation. For four of the studies, even summaries are not available. EPA has implemented ACC’s earlier demands – lock, stock, and barrel. Let’s unpack this a bit further. EPA has accepted without question “a claim of business confidentiality” and asserts these studies are protected under TSCA as CBI. Yet section 14(b) of TSCA, titled “INFORMATION NOT PROTECTED FROM DISCLOSURE,” (emphasis added) says the opposite. That section explicitly states that section 14’s protection from disclosure for CBI does NOT extend to “any health and safety study” or “any information reported to, or otherwise obtained by, the Administrator from a health and safety study.” Nowhere does this language or TSCA as a whole make any distinction between full studies and summaries – section 14’s protection from disclosure does not apply to either. The studies in question clearly constitute health and safety studies, as that term is defined under TSCA. EPA itself states that the studies “were conducted to determine the physical-chemical properties (n=2), environmental fate properties (n=2), human health hazards (n=17) and environmental hazards (n=3).” Notably, EPA does not even acknowledge section 14(b)(2)’s provision that health and safety studies are not CBI, much less articulate a theory for why this information should not be disclosed in light of this provision. EPA’s failure to make the full studies available to the public is blatantly illegal and a slap in the face to the 2016 bipartisan reforms to TSCA that sought to increase public access to information on chemical risks. EPA has also announced that the PV29 draft risk evaluation will undergo peer review by the TSCA Scientific Advisory Committee on Chemicals (SACC). A four-day meeting will take place January 29-February 1, 2019, running for half of the first day and from 9-5:30 ET each of the other three days. One hour of the approximately 28-hour meeting will not be open to the public because the SACC peer reviewers are receiving the studies EPA asserts are CBI; see yet another memo, this one from Dr. Nancy Beck and approved by Acting EPA Administrator Andrew Wheeler. So just how is this supposed to work? Questions abound. Will the peer reviewers be barred during the 27 hours of the meeting that are open to the public from mentioning any aspect of any of the “confidential” studies that is not included in the corresponding summary of that study? Are they instead to hold off discussing any of these issues until that single private hour of the meeting? What happens if one of them slips – will the record be expunged? Will EPA censor, or force these scientists to self-censor, their peer review report? As to being “cleared for TSCA CBI access,” EPA has always made clear that is a very big deal, entailing fairly extensive training and agreeing to adhere to stringent procedures – not to mention agreeing never to mention to anyone not cleared for TSCA CBI access anything deemed to be confidential. Nor is any of this to be taken lightly: TSCA section 14(h) imposes criminal penalties for anyone found to have willfully disclosed TSCA CBI. Just how can a robust, open peer review that the public can have any confidence in be conducted under these circumstances? Bear in mind that some EPA staff and the SACC members – and, of course, the industry – will all have the studies EPA is claiming are CBI. Only the public and workers (including stakeholders representing their interests and any media following this story) will be denied access to this information that they’re entitled to under TSCA. I have to wonder how many of the peer reviewers understood they were signing up for, and are comfortable with, all this. Some of you may have followed the major controversy that erupted earlier this year over a proposed rule that EPA issued (and is still pending) that would bar the agency from using any study unless that study and all of its underlying data, models, etc., are made public. That misguided proposal garnered widespread opposition from the nation’s scientific community because, among other concerns, of the widespread recognition that there are legitimate constraints on such disclosure due to legal and ethical protections on the confidentiality and privacy of human subject data. Here, of course, the opposite is true: EPA is denying the public access to information on chemical risks that TSCA itself clearly precludes from being withheld. If that isn’t a double standard, I don’t know what is. This entry was posted in EPA, Health Policy, Industry Influence, TSCA Reform and tagged American Chemistry Council (ACC), Confidential Business Information (CBI), Pigment Violet 29 (PV29). Bookmark the permalink. Both comments and trackbacks are currently closed.